Nationally important populations in the East Thames Corridor, but highly threatened. Forage areas need to be considered separately for queens and workers. The queens require nectar resources early in the season after their long winter hibernation to build up their reserves. They then need pollen resources for stocking cells in newly established nests to enable the first workers to develop. Workers also require nectar and pollen resources both for their own sustenance and to stock the developing nest. 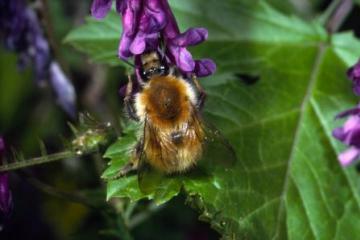 It appears that areas of fairly tall, open flower-rich grasslands providing areas of abundant forage are required to support populations of Bombus humilis, but it is more able to utilise suitable small areas within a landscape than Shrill Carder Bee, another bumblebee with a nationally important metapopulation in the region. Observations suggest that large patches of flowers are used more frequently and are much more important than widely distributed resources. Observations also indicate that the availability of suitable forage (nectar and pollen) sources throughout the whole season from May to September is crucial.